Participants can help craft a birch bark canoe and engage in a community-sharing circle to explore the significance of the canoe to Omàmiwinini and Anishinaabe histories and lived experience. Knowledge holders will share stories and discuss how crafting materials remains important to the survival of Indigenous cultures and traditional skills. Light snacks and refreshments will be provided, but bringing your own lunch is recommended. This event will help build positive, respectful relationships, essential for the survival of our local communities, cultures, and economies of the Lanark County area in the context of reconciliation and Canada's 150th anniversary. All are welcome, you can even bring your pets! Plenty Canada is proud to be hosting Tim Johnson and The Ollivanders for a special event in Lanark, Ontario on August 25th, 2016. Tim will be giving a presentation that highlights Native contributions to Canada during its early history, followed by a lively short film and talk about contemporary Indigenous influences upon popular music. The presentation, which begins at 6:30 p.m., will be followed by a “Rock Concert In The Woods” by The Ollivanders at 7:30 p.m.!! Tim Johnson, Mohawk from Six Nations of the Grand River, is the former associate director for Museum Programs at the Smithsonian Institution’s National Museum of the American Indian. He currently serves as co-chair of Landscape of Nations, the forthcoming national memorial dedicated to Six Nations and Native Allies in the War of 1812; to be unveiled on October 2 in Queenston Heights Park. The Ollivanders are a Native American Music Award-winning rock band from Ohsweken and Caledonia, Ontario. Their music has been licensed by Disney for ABC | ESPN's Saturday Night Football, heard on the breakout APTN series Mohawk Girls, and reached number one on the National Aboriginal Music Countdown. The band has performed at numerous venues including the ROM in Toronto and the Smithsonian in Washington and New York. The event will be hosted at 266 Plenty Lane, in Lanark (at the Plenty Canada head office). There is no cost for admission to the event, but, as always, donations in support of Plenty Canada are welcome. Bring lawn chairs and umbrella’s if necessary. But mostly, bring your sincerity and Peace and Love! There is also a park entrance fee for each car coming to park, so keep your Pass from Park to get one free admission to Pow Wow grounds. Our Executive Director, Larry McDermott, has been invited to Lima, Peru this March for the 4th World Congress of Biosphere Reserves. 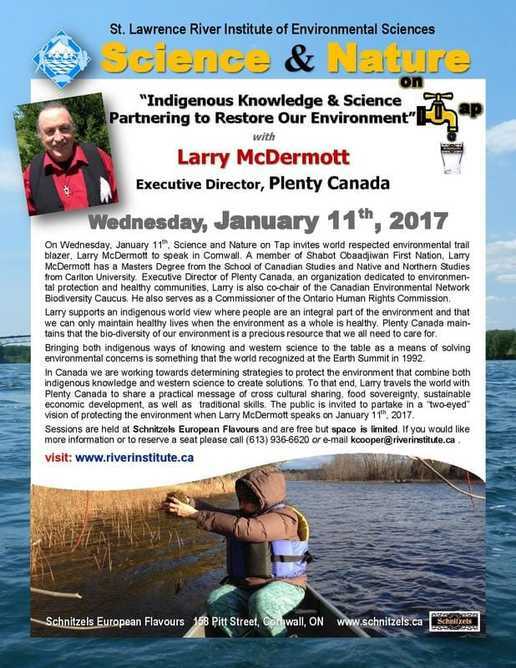 The United Nations Educational Scientific and Cultural Organization (UNESCO) is hosting the event and Larry has been selected to host a side event on the topic of Indigenous engagement in biosphere reserves; more specifically, Achieving Sustainable Development Goals Through Indigenous Partnerships.